Famous for being the home of the Klondike Gold Rush, the Yukon Territory is full of picturesque trails perfect for hiking in summer months. Guests staying at Westmark Hotels in Skagway, Alaska, or Dawson City and Whitehorse in the Yukon have many options when it comes to finding the right path to explore nature. 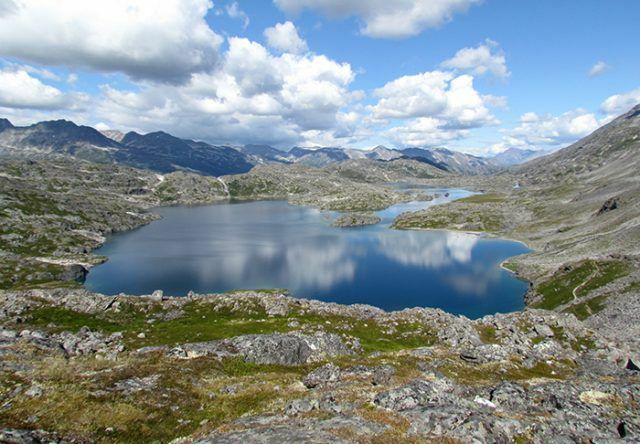 The most historic trail in the Yukon might just be the Chilkoot Trail, considered by many to be the best hike in the area. Featured in the iconic and ever-popular 1994 educational computer game “The Yukon Trail,” the Chilkoot Trail runs 33 miles from Dyea, Alaska, (15 minutes from Skagway) through the Klondike Gold Rush National Historical Park to Lake Bennett in British Columbia, Canada. Travelers generally make the hike one direction and take the train back to Skagway. The expedition usually takes three to four days to complete, with moderate terrain along the way. Through coastal rainforests and steep climbs down into rocky subalpine valleys along the Taiya River, the Chilkoot Trail has everything a northern adventurer might seek. Glacier views, suspension bridges, rusted old relics from the Gold Rush, endless wildlife, secluded lakes, campgrounds, rest areas and a trek over the international border into Canada are all included on this trail. Make sure to book your trip in advance, the National Park Service and Parks Canada allow no more than 50 backpackers to begin the Chilkoot Trail each day. A much shorter trail that starts just minutes from the dock in Skagway is the Lower Dewey Lake Trail. This hike can be completed in an afternoon, as travelers are able to reach the lower lake in 30 minutes for a one-hour roundtrip journey. There is an option to loop around the lake that can take at least twice as long, but is definitely worth the trip. Lovely forests, serene lakes, rushing rapids and mountain views overlooking ships in the harbor make this quiet hike a nice escape from the bustle of the city. Further north from Skagway in Dawson City, there are just as many world-class trails for hiking. The Ninth Avenue Trail is easily accessible from downtown Dawson and is a 1.5-mile trail that loops around town and allows access to a few other trails such as the Crocus Bluff Trail, Midnight Dome Trail and the Moosehide Trail. The Ninth Avenue Trail is an easy hike, featuring the remains of old gold rush settlements. The short 30- to 45-minute hike offers side trails, boardwalks, stairs and historic sites like the cabins of Robert Service and Jack London as well as the Yukon Order of the Pioneers graveyard. Another popular hike a bit further out of Dawson City is the Grizzly Ridge Trail in Tombstone Territorial Park. The trail is easy to follow as it meanders through the forest with a mild incline as hikers near the ridge. The scenery opens up within an hour of hiking and offers clear views of Mount Monolith at the end of Grizzly Valley. After about three miles to the ridge, the trail continues toward Grizzly Lake. It is an ideal trail for people of all energy and skill levels and can be completed in two to three hours. Whether you’re an avid outdoorsperson or someone who prefers nature in small doses, there is an abundance of hiking in the Yukon that will suit everyone’s taste. Ask around and do some research and you’ll be on your way to your new favorite hike in no time. Make sure you always tell someone of your travel plans when headed out into the wilderness. Prepare yourself for unexpected wet weather and wild mammal encounters and you should be as golden as a prospector’s dream.